I should start by saying that while I am a lover of American muscle cars, I really enjoyed my time in the Kia Soul. This funky little 5 door is surprisingly fun to drive while offering impressive passenger and cargo space for such a small vehicle wrapped into a package that has the distinctly aggressive Kia styling. The 2014 Kia Soul takes that family styling a step further on the outside while the inside receives some new optional items that allow buyers to drive away in a vastly more luxurious Soul. On the outside, the 2014 Kia Soul sports a vastly redesigned front end with the changes beginning with the basic layout of the lights. The 2013 Soul headlights have rounded tops with flat bottoms, trimmed by an LED driving light bar that is mounted in what looks like a separate lens assembly. The new 2014 Soul still has the LEDs but that have been moved to the top of the new headlight assembly with a concave top line making for an angrier looking vehicle. Along the bottom of the front fascia, the lower grille opening has been enlarged, with four separate slots above that grille opening and a new set of fog lights flanks each side of this enlarged grille. Finally, the lower portion of the front fascia is now finished in matte black, matching the grille fillers and bolstering the sporty look of the new Soul. Out back, the 2014 Kia Soul features an enlarged rear door for easier loading of large cargo and with that larger opening comes a back end that has been shifted around a bit. The back glass transitions smoothly into gloss black trim that runs around the back end, incorporating the larger LED taillights. The black strip that ran across the middle of the 2013 Soul rear end is gone and the reflectors that were once housed in that black strip have been shifted down and inward – now connected to the protruding license plate area in a similar design to the fog lights up front. While the changes to the front end made the new Soul look more aggressive, the changes to the rear end have given the 2014 Soul a much more fluid, upscale, sophisticated look. The 2014 Kia Soul is slightly larger than the current 2013 model year version and that added size equals added interior space but a few extra inches of elbow room is just the start of things. Soft touch materials have been added throughout the cabin and there is now an optional leather interior package for those Soul buyers who want more luxury out of their compact Kia 5-door. Also optional for 2014 is a new 8 inch infotainment touchscreen that operates with a “flick to scroll” design like most modern Smartphones and tablets along with a new larger Thin Film Transistor (TFT) driver information screen in the gauge cluster that includes turn by turn navigation display in properly equipped models. Finally, while the 2014 Kia Soul comes with the same 1.6L and 2.0L 4-cylinder engines mated to the buyer’s choice of an automatic or manual transmission, the use of high strength steel improves chassis rigidity by 29%. Added rigidity equals added handling, ride quality and safety and the high strength steel offers weight advantages over traditional chassis components. There is also a reworked suspension setup featuring new subframe bushings, a relocated front stabilizer bar and new repositioned rear shock absorbers that all work together to improve ride quality, reduced interior noise and improve handling. 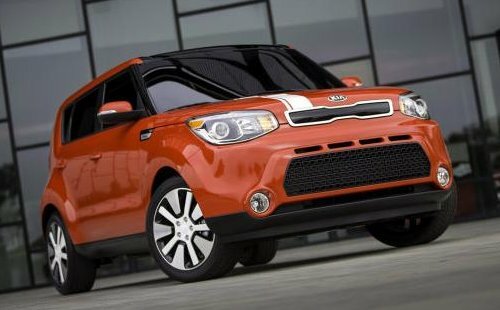 The 2014 Kia Soul is expected to hit showrooms in the third quarter of this year. Pricing, fuel economy and other specific details will be announced closer to the dealership debut. The 2014 Soul will continue to be on display at the 2013 New York Auto Show through this weekend but if you cannot make it to the Big Apple by Sunday, click any of the thumbnails on this page for a closer look at the refreshed Soul!